Today! Today, I can go get a pattern I for something I saw posted months ago in the Sew Obsessed forum on ravelry. This flyer came out at the beginning of the month, so I wrote the day on the calendar and waited. Just hope one of the Joann’s store have it in stock. I have never waited for a pattern sale before. If there is something I want to make and I am lucky enough to catch a sale, then it is great. If not I just pay the regular Joann’s markdown price. 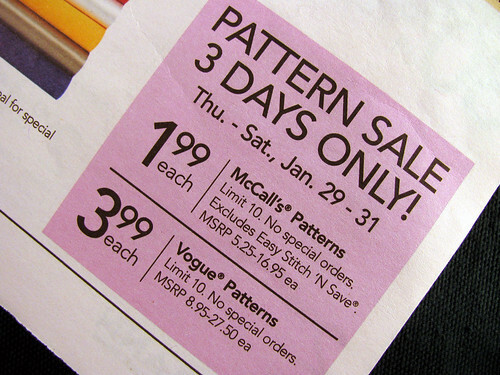 I never realized how long it was between pattern sales before. Maybe by blogging about this 3 day event, it will remind another sewer and they won’t miss this sale like I missed the last one. This entry was posted on Thursday, January 29th, 2009 at 3:00 am and is filed under Sewing. Tagged: Sewing. You can feed this entry. You can leave a response, or trackback from your own site. Thanks! I lost my sales flyer so would have missed the sale. Good thing I always read your blog..